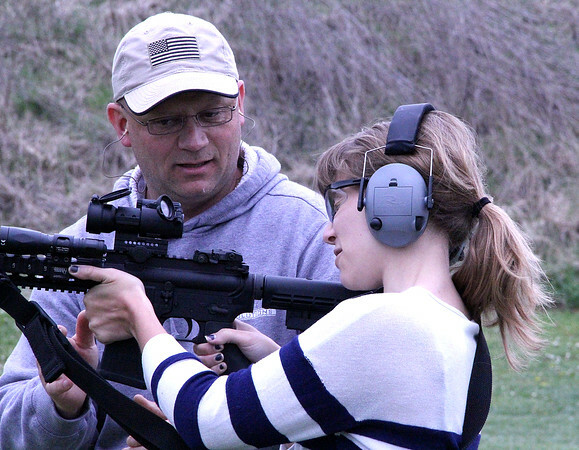 HANDS ON: Lebanon Police Department Captain Chad Morgan, the department's lead firearms instructor, works with The Lebanon Reporter's Elizabeth Pearl on firing an AR-15 in an exercise similiar to the training officers must go through. LPD Chief Tyson Warmoth said close to 12 of LPD's officers have passed the requirements to carry AR-15s in their patrol cars. He hopes the remainder of the force will soon follow suit. "They have to know the nomenclature, maintenance, cleaning, disassembly, reassembly, and then go to the range and learn proper handling and marksmanship and then shoot a qualifying score for this weapon to be issued to them," Warmoth said.